KUCHING: Mastering the English language is no longer a matter of luxury, but a matter of survival, says Minister of Education, Science and Technological Research Dato Sri Michael Manyin. Manyin said mastering English language skills is necessary to make it in today’s interconnected world. “English is a language of science, technology, aviation, diplomacy. 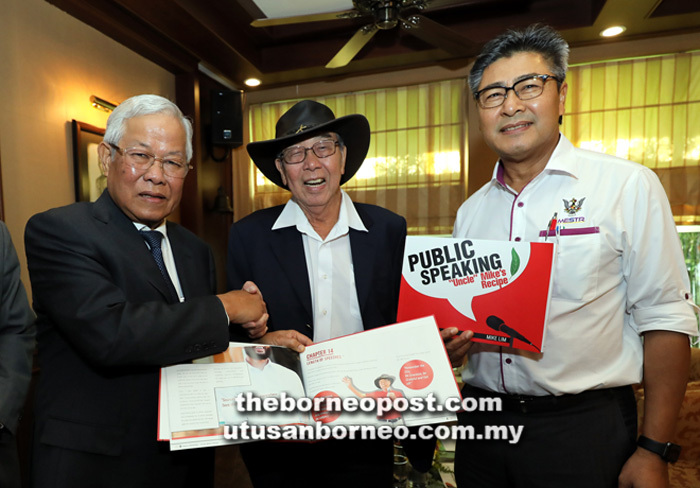 If you want to compete and survive in this hyper-connected world, you cannot escape from English,” he said when launching ‘Public Speaking – Uncle Mike’s Recipe’ by toastmaster Michael Lim Seng Gyup yesterday. The ministry will distribute two copies of ‘Public Speaking – Uncle Mike’s Recipe’ to all 198 schools in Sarawak. The public speaking guide covers elements such as speech writing, speech presentation, and the use of visual aids. Lim wrote the book to share his passion and it is aimed at all levels of society interested in enhancing public speaking skills. “Try and try and try. If you make a bad speech, it’s not the end of the world. Take it as a lesson,” he advised. Lim also suggested developing a public speaking workbook for schools in Sarawak.